Taking snapshots with your smartphone is convenient, but are those photos always good enough for preserving special moments? The COOLPIX S5300 captures fantastic photos and 1080/60i Full HD videos—sharp low-light and action shots, detailed close-ups and more—and you can still share them instantly with your smartphone! Zoom in with the power of 8x optical zoom and 16x Dynamic Fine Zoom, and a genuine NIKKOR glass lens, then marvel as your shot instantly appears on your compatible smartphone or tablet for easy sharing by email, text message or uploading to your favorite sites. You can even use your smartphone or tablet to take pictures with the COOLPIX S5300—perfect for self portraits and group shots that actually include you! Great moments deserve to be shared, and the COOLPIX S5300 makes it easy to share them beautifully. Every COOLPIX is designed around a genuine NIKKOR glass lens, the legendary optics that have helped make Nikon famous. The COOLPIX S5300’s 8x optical zoom lens goes from wide-angle—great for portraits and landscapes—all the way up to telephoto—great for closeups of sports, concerts, nature and more. When you need even more reach, zoom up to 8x with optical zoom and 16x with Dynamic Fine Zoom, an enhanced digital zoom function that effectively doubles your reach. Your smartphone or tablet will be your favorite accessory! Take beautiful photos with the COOLPIX S5300 and watch them instantly appear on your compatible smartphone or tablet±. Then share them without missing a beat—text them, email them, upload to your favorite social networking site—it’s your choice! You can even use your smartphone or tablet as a remote control for the COOLPIX S5300, perfect for self portraits and group shots that actually include you. Imagine being able to shoot without a flash at weddings, concerts, parties—anywhere your flash normally fires. You won't have to interrupt a moment to capture it, and your photos will look more natural and true to your memory. The COOLPIX S5300 performs so well in low light situations that, in most cases, using the flash is optional. Of course, when the lighting is extremely poor and you need a flash, it'll be there. Easily match your situation to one of 18 Scene Modes like Beach, Snow, Night Portrait, Sunset and more, and enjoy effortless great shots. Or, choose Scene Auto Selector and let the camera choose for you. There’s nothing worse than a shaky handheld video. As soon as you start recording with COOLPIX S5300, Hybrid VR (Vibration Reduction) activates and combats camera shake for sharper steadier home movies. It's frustrating when a smartphone camera focuses on the wrong thing. With COOLPIX S5300, Target Finding AF quickly determines your intended subject and puts the focus where it belongs—on your subject. 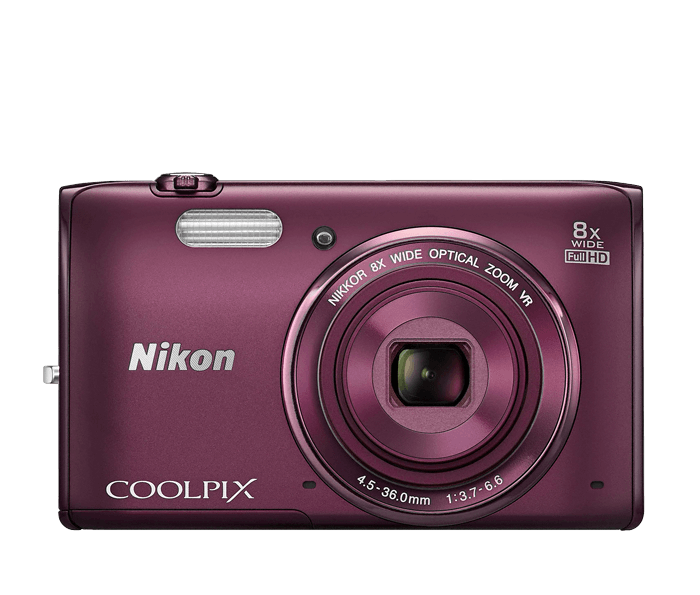 The COOLPIX S5300's large, LCD display makes it easy to compose your shots or monitor your video recording. Reviewing and sharing your creations is a pleasure, too—every shot looks fantastic on the display. Based on Camera and Imaging Products Association (CIPA) standards for measuring the life of camera batteries. Measured at 23(-/+2)°C (73(-/+4)°F); zoom adjusted with each shot, flash fired with every other shot, image quality set to Normal, image size set to 4608 x 3454 (16.0MP). Battery life may vary depending on shooting interval and length of time menus and images are displayed.